"These days, Washington is stuck in a nasty Nash equilibrium. The two dominant parties—the anti-tax, anti-regulation, anti-government wing of the Republican Party, and the raise-taxes-on-the-rich-but-don’t-touch-my-entitlement wing of the Democratic Party—have fought each other to stalemate. Every few weeks or so, some event or deadline comes along that appears to hold out the prospect that one side or the other might prevail and thereby break the deadlock. But, in the end, nothing really gets resolved, nobody wins and the stalemate continues." This model does not fit what's been happening lately in Washington. Take the collapse of the super committee. The Democrats offered a deficit-reduction package consisting, in roughly equal measure, of budget cuts and tax increases. The Republicans rejected that. The Democrats then came back with a package in which budget cuts were more than twice revenue increases. The Republicans rejected that, too. Eventually the Republicans offered a package that contained lots of budget cuts and a smidgen of tax increases. The Democrats probably would have accepted it if the Republicans hadn't paired this with an insistence that the Bush tax cuts, which are scheduled to expire at the end of 2012, be extended, thereby turning their "tax increase" into a gigantic tax cut (and increasing rather than reducing the deficit). The only way to break such a stalemate is for the Democrats to surrender. But the latest go-round over extending the payroll tax cut suggests that even Democratic surrender doesn't get you to yes. Let's review. First the Senate voted down a Democratic plan that paid for extending the payroll tax cut by raising taxes on millionaires. Then the Senate voted on a Republican plan that paid for extending the payroll tax cut through various alternative means. The Senate voted that down, too, with a majority of Republicans and a majority of Republican leaders, including the Republican whip, rejecting the GOP's own compromise. Then the House passed a version that attached a provision requiring the president to abandon his plan to delay a decision on the controversial Keystone XL pipeline. The president said he would veto any bill that included pipeline language. 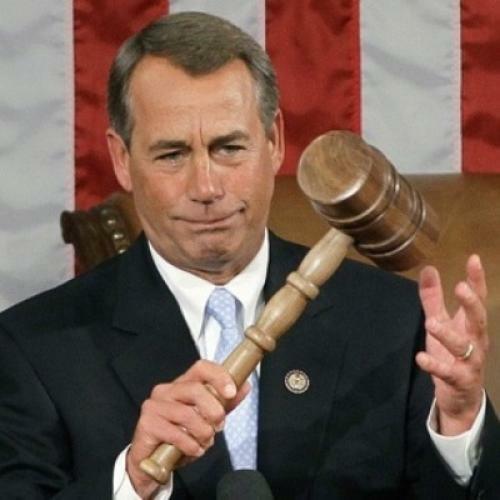 The Republican House speaker demanded a Senate vote on the House plan. The Republican Senate leader blocked such a vote. The Democratic Senate leader said there would be no vote to fund the government past the end of the week until the payroll tax cut matter was worked out in a bipartisan manner. Then the Democratic Senate leader caved and allowed a vote to fund the government past the end of the week before he took up the payroll tax. Then the president caved and accepted a bill passed by the Senate to extend the payroll-tax cut that was tied to a provision requiring him to make a quick decision on the pipeline. The bill only extended the payroll-tax cut until February, another setback for Democrats. And now, according to the latest news, the House Republicans are preparing to reject this surrender by the Democrats because ... well, I'm not really sure what the reason is. But apparently it has a lot to do with feeling that the Senate Republicans are pushing them around. Or that their own Republican speaker is pushing them around. (Though he's now saying he doesn't like the Senate bill either.) Possibly it's because a sizable portion of the GOP has come to believe that any deal that Democrats will accept is inherently corrupt. Even a deal to cut taxes, which is one of only three things the Republicans know how to do. The other two are eliminating regulations and increasing the defense budget. Cutting taxes happens to be the most important part of the GOP trinity--so much so that many Republicans have taken a pledge never to raise taxes. But the anointed referee, Grover Norquist, has ruled that allowing the payroll tax cut extension to expire would not constitute favoring a tax increase (even though allowing the Bush tax cuts to expire would). Pearlstein believes the solution is to refuse to give political contributions to either side until Democrats and Republicans learn to cooperate. But as the foregoing demonstrates, even capitulation by Democrats does not achieve agreement. The problem isn't Democrat vs. Republican. It's Republican opposition to Democrats, to other Republicans, and ultimately to anything that runs the slightest risk of being labelled a "compromise." The public seems to understand this. A recent Pew poll shows that the public blames Republicans in Congress specifically for intransigence. Independents blame Republicans in Congress specifically for intransigence. Even Republicans blame Republicans in Congress specifically for intransigence. What we need is a game-theory model that demonstrates how to get the Washington press corps and third-way goo-goos to accept what everybody but them seems to know. The Republican party is at war with Democrats, with reality, and ultimately with itself. It has gone insane. The only strategy I can think of is to watch the GOP self-destruct and hope the result benefits Democrats in November.